This past holiday season, Syracuse Stage patrons donated over $29,000 for organizations providing support for people living with HIV or AIDS. This marks a record-breaking figure for the annual campaign in Syracuse, an effort coordinated by Broadway Cares/Equity Fights AIDS at theaters across the nation. In 21 years of the campaign at Syracuse Stage, audience members have donated over $337,000 for this cause. 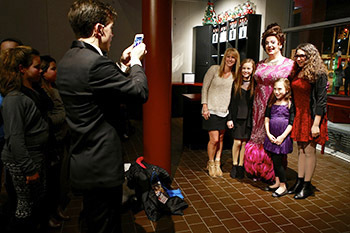 David Lowenstein (as Edna) poses with patrons in the lobby as Kyle Anderson (Corny Collins) takes a photo. Photo by Michael Davis. Collections will be divided among three organizations— Broadway Cares/Equity Fights AIDS and two local organizations—the DePalmer House and the Pediatric AIDS Unit at Upstate Golisano Children’s Hospital. Leading the efforts were cast members of “Hairspray,” a co-production between Syracuse Stage and Syracuse University’s Department of Drama. After each performance, cast members were stationed in the lobby to greet patrons, sign posters and take pictures. Mark David Kaplan, an Equity cast member and alumnus of Syracuse University Department of Drama, led many of the appeals with a speech after the final bows. In addition to donating toward Broadway Cares/Equity Fights AIDS, “Hairspray” patrons donated non-perishable food items that will stock the pantry at Grace Episcopal Church, and over 150 winter coats, hats and gloves that been given to the students and families at Franklin Elementary School in the Syracuse City School District.